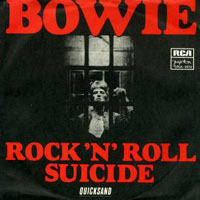 (1974) "Rock 'n' Roll Suicide"
"Rock 'n' Roll Suicide", recorded on 4 February 1972, was one of the last songs recorded for Ziggy Stardust, along with "Suffragette City", which would immediately precede it in the album track list, and "Starman", soon to be issued as a single. As the final song on the album and climax to the Ziggy Stardust live shows throughout 1972–73, it soon became a slogan, appearing on many fans' jackets. In April 1974 RCA, impatient for new material and having already rush-released "Rebel Rebel" from the Diamond Dogs sessions, arbitrarily picked the song for single release. Two years old, and already in the possession of most Bowie fans through Ziggy Stardust, its release has been labelled simply a "dosh-catching exercise". It stalled at No. 22 in the UK charts – Bowie's first RCA single to miss the British Top 20 since "Changes" in January 1972. In 1974, Bowie recorded a blue-eyed soul version of the song for his live album David Live. Bowie played the song on the BBC show Sounds of the 70s with Bob Harris on 23 May 1972. This was broadcast on 19 June 1972 and in 2000 released on the album Bowie at the Beeb. A live version recorded at Santa Monica Civic Auditorium on 20 October 1972 has been released on Santa Monica '72 and Live Santa Monica '72. The version played at the final Ziggy Stardust concert at the Hammersmith Odeon, London, on 3 July 1973 was released on Ziggy Stardust – The Motion Picture. Before beginning the song, Bowie announced: "Everybody... this has been one of the greatest tours of our lives. I would like to thank the band. I would like to thank our road crew. I would like to thank our lighting people. Of all of the shows on this tour, this particular show will remain with us the longest because not only is it—not only is it the last show of the tour, but it's the last show that we'll ever do. Thank you." This version also appeared in the Sound + Vision boxed set. A live recording from the first leg of Bowie's 1974 tour was released on David Live. A live recording from the second leg of the same tour (previously available on the unofficial album A Portrait in Flesh) was released in 2017 on Cracked Actor (Live Los Angeles '74). Bowie retired this song from his live repertoire after the 1990 Sound+Vision Tour. Phish - Las Vegas 31 October 2016, and repeated as part of their "Baker's Dozen run" at Madison Square Garden on 1 August 2017. In July 1998, artists Iain Forsyth and Jane Pollard presented a recreation of Ziggy Stardust's farewell concert, titled A Rock 'n' Roll Suicide, at the Institute of Contemporary Arts in London. In the skateboard video, "Sorry" by Flip Skateboards the song is used during Arto Saari's part. It plays over the end credits in the film What We Do Is Secret about the life and death of Darby Crash, the lead singer for the Germs, who committed suicide. It plays during the end scene of the Season 5 finale episode of Ray Donovan. The episode is entitled Time Takes A Cigarette. This page was last edited on 12 April 2019, at 07:48 (UTC).